Home > About Council > Work for Council > Why Work for Council? 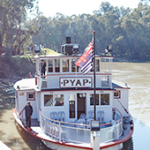 Located on the banks of the Murray River, our region offers a relaxed lifestyle, scenic views but with all the features you expect from the city. Swan Hill is home to three major supermarkets; a diverse range of award winning restaurants and cafes; a wide variety of retail stores; gyms and sporting clubs; and is home to a delicious range of local stonefruit, olives, almonds and wine. Our community is proud, welcoming, and with more than 40 nationalities represented, offers a diverse and culture-rich experience. The Swan Hill region is rich in culture and blessed with local produce and wine. And all this is surrounded by the country’s most beautiful natural asset, the Murray River. What is Swan Hill Rural City Council? Swan Hill Rural City Council is one of 79 local governments across Victoria, and employs about 300 staff in Swan Hill, Robinvale, Lake Boga, Nyah West and Manangatang. Council is also committed to career development and offers regular internal training programs, mentoring and leadership programs, and subsidised higher education and study leave. Staff also enjoy an active social club, staff events, and corporate wellness programs like subsidised gym memberships, and free medical and skin cancer checks.